Posted September 8, 2016 by Shopping ForHealth & filed under Breakfast, Cheese, Dairy. 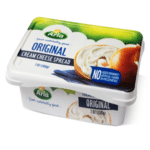 Are your shoppers familiar with the flavors of Arla Cream Cheese? When you’re talking about the importance of breakfast, this is a product to keep in mind. Arla Cream Cheeses are naturally delicious and made without artificial flavors, colors or preservatives. The five flavors of Arla: Original, Light, Blueberry, Herbs and Spices, and Peppercorn. The original cream cheese is made with just four ingredients: cream, buttermilk, cheese culture and salt. This is half the number of ingredients found in other cream cheeses. And the nutritional profile of the Light variety is particularly impressive: 60 calories, 5 grams of fat and 3 grams of saturated fat, compared to 200 calories, 23 grams of fat and 15 grams of saturated fat found in butter. When talking to shoppers, remind them about other bagel toppings that can impact good health. Smash red raspberries or blackberries in a bowl and spread on top of the cream cheese in place of jam, for example, to add a portion of real fruit. Look in the drawer of the fridge for inspiration on vegetables that pair well with the savory Arla flavors. Thinly sliced beets are perfect when paired with chopped pistachios. Shredded carrots, chopped onions, and olives with Arla Herbs and Spices cream cheese make a delicious combination as well.